This month, my theme is about letting yourself expect big things. Selection, qualification and just the pure volume of training that you are going through can be simultaneously terrifying and thrilling. Be smart, push yourself, and prepare yourself more than you ever have before. Put yourself into a position where you have earned enough confidence so that you can expect to win. When people find out that someone has been to the Olympics, right after their very wide-eyed and respectful “Really? Cool! !” they get asked, “How did you do?” I find that people may be bold or shy, but they are always curious and they almost always ask. A few years ago, I was on vacation in Brazil, kayaking with a group, most of whom I didn’t know. They didn’t know about my sport background, and I wasn’t really giving them any more info on me than was required. After a few days, the group had learned that my sport of choice was rowing and that I had rowed for my university and even for my National team. Sticking with my plan to answer questions honestly but give no more info than required I replied, “I did as well as I could have expected, thank you.” The guy congratulated me but I could tell that he thought I’d done poorly. He moved on to talk to some other people. Shortly he returned, “You lied to me!” I didn’t understand what he meant. He told me that he had just been speaking with another Canadian in the group and when he had asked her if she knew that I’d been to the Olympics, she had said. “Sure. She was in all the news when she won.” He thought I had lied about my Olympic results. I told him that I didn’t lie; it was his fault if he expected a mediocre result. I said I had done as well as I could have expected and; Kathleen Heddle (my rowing partner) and I had expected to win. Just because he couldn’t imagine being able to win at the Olympics didn’t mean I couldn’t! 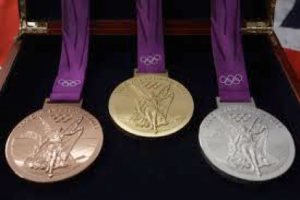 You will never know that you WILL win a medal, but it’s great to know that you CAN. That knowledge comes from your technical, physical and emotional preparation- that comes from your today. p.s. – honestly… the YouTube clip is hilarious. Possibly the ‘best’ post race interview ever! Please watch! This entry was posted in Mentor Messages and tagged best answer, high expectations, London 2012 by Marnie. Bookmark the permalink.